When Matt Tappert studied abroad in Tomsk, Russia in 2008 as part of the Critical Language Scholarship Program, he had the simple goal of participating in an immersive program that would help develop his Russian language skills and cultural knowledge. He knew that he was interested in Eurasia, but he wasn’t quite sure yet what he wanted to do with his career. His time in Tomsk and his fellow CLS participants helped him answer this question. In the 10 years since his CLS Program, Matt has embarked on a career dedicated to promoting democracy and good governance in Eurasia. “Study of Russian and cross-cultural skills became the foundation for everything that I did after [the CLS Program],” Matt said. After his time in Tomsk, Matt served in the Peace Corps in the Kyrgyz Republic where his Russian language skills helped him not only to develop and implement projects more effectively, but also to learn Kyrgyz more quickly that he would have otherwise. Since then, Matt has worked on a number of development projects in Central Asia where he spent every day working in Russia. 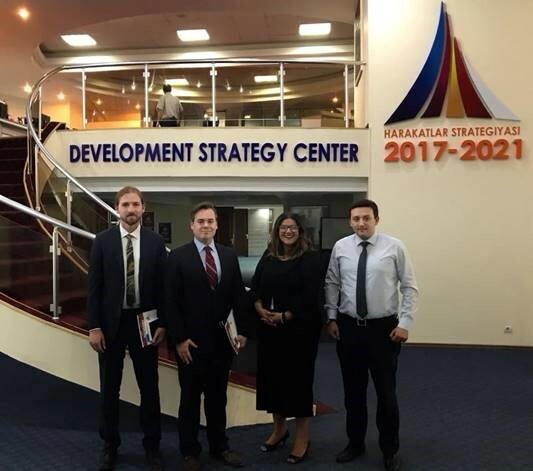 He worked on projects for the U.S. Department of State, USAID, and the National Endowment for Democracy in the region, and in 2017, he served as an accredited international observer of the Kyrgyz Republic’s presidential election. Matt is now based in Washington, DC, working as a Program Officer within the Eurasian Division of the International Republic Institute, a non-partisan NGO that implements democracy-promotion and governance development programs around the world. He works on programming in the Kyrgyz Republic focused on municipal governance and promoting the political involvement of women and youth, and his Russian knowledge continues to be essential to his daily work. He encourages others interested in working in Eurasia to not only study Russian, but to also seriously explore their career options as CLS helped him to do.